Wednesday August 15, 2018 - Nairobi Governor, Mike Sonko, has today admitted that Nairobi is controlled by State House under the leadership of President Uhuru Kenyatta. 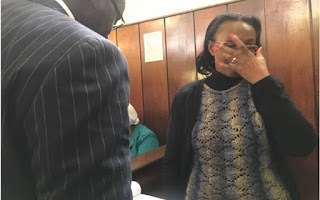 Sonko made the revelation after Nairobi City officers arrested the wife of Kiambu Governor, Ferdinand Waititu. During a telephone conversation with Waititu, Sonko told the Governor that his wife was arrested under orders from above (State House). Waititu's wife, Susan Wangare, and 14 others were arrested over the construction of illegal buildings in Nairobi. “(I am breaking the law by securing the release of our wife. Call the boss or Waita concerning the others)." Waititu wonders why his friend asks him to call State House yet he is the County boss. "Ona, ona, unajua mimi Nairobi nimekaliwa na order inatoka juu."